Nintendo released their financial data recently over on their official Japanese website, recounting how they’ve shipped 2.7 million Nintendo Switch SKUs worldwide, and that they’ve moved a combined 3 million units of Legend of Zelda: Breath of the Wild for the Nintendo Switch and Wii U. 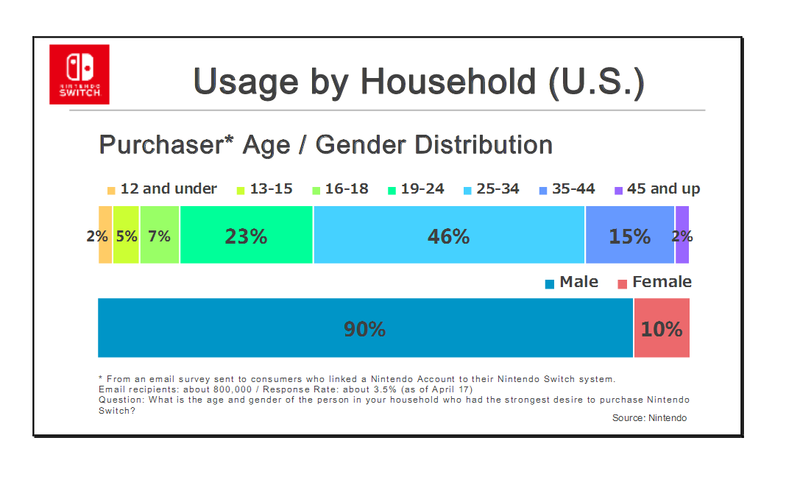 Most shocking to some people was that despite the ESA consistently touting even splits between male and female gamers (by blurring the line with genres and platform interest), the financial report indicates that 90% of the members of the household interested in a Nintendo Switch skewed males. The stat is available for viewing below. The largest demographic are males between the age of 25 and 34 years of age. The next majority is between 19 and 24, and then 35 through 44. The two smallest percentages were kids under 12 and adults over 45. Unlike the ESA, Nintendo didn’t try to muddle the data to prove a point. They’re trying to sell a product, and they need honest numbers so they know how to curate content out of the gate, and showcase the numbers to studios so they know how to target demographics on the Switch. This easily explains why Starbreeze was quick to port over Payday 2 to the Switch, since these are the kind of games that ultimately appeal to the specific demographics who appear in the chart above. Those on NeoGaf were disappointed and angry at the stat given that the ESA had led them to believe that there’s an even split between core gamers in the marketplace between males and females. However, the reality is that – as linked to from KIA – Quantic Foundry did an independent survey consisting of 270,000 participants and found that the data showed that females just like playing specific kinds of games, as evident in every other survey. Match-3 and casual games topped out on the charts, while RPGs were also favored amongst female gamers as well. BioWare’s titles were also very popular among the female gamers, with Star Wars: The Old Republic and Dragon Age: Inquisition skewing higher above the average percentages in their respective categorical genres. What’s interesting about that stat is that Assassin’s Creed: Syndicate was reportedly one of the lowest selling entries in the series next to Assassin’s Creed: Rogue, according to IB Times, and other stats such as the listings on Game Revolution. Ubisoft blamed the sales on Assassin’s Creed Unity being a poor outing for the franchise, which impacted Syndicate’s sales, as reported by PlayStation Lifestyle. In a way, this kind of shows that even though they had a larger than average amount of female consumers purchase the game compared to other open-world games, Assassin’s Creed Syndicate still sold less than one of the worst entries in the series, and lost a large portion of its male player base. What’s more is that the uptick from the female contingent was not enough to cover for the loss of the male consumer. Even two years removed from its release, Assassin’s Creed: Syndicate still only has a moderate 100,000 more sales than Assassin’s Creed: Rogue, according to the Steam Spy charts, and is still one of the poorest selling mainline entries in the series. So what does this all mean? 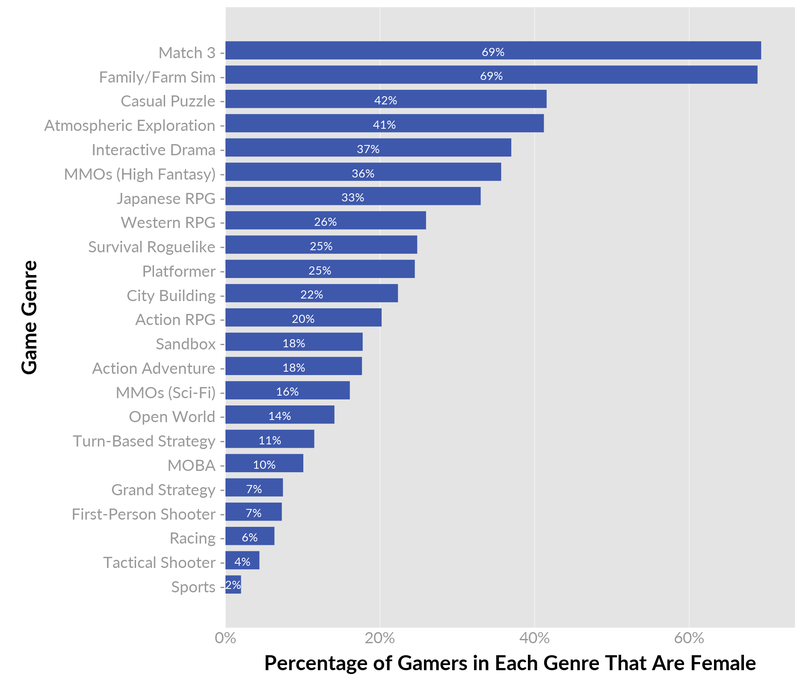 It means that you can reach a female demographic adding female characters to certain kinds of games, and focusing more on story than out-and-out action or PvP-style competition (viz., games like Dota 2 and League of Legends have some of the lowest numbers of female players out of all the genres along with sports games, even with a lot of playable female characters). However — even adding in playable females and focusing more on story than action in an AAA blockbuster title — it looks like it’s still only going to reach a smaller market pool within the AAA sector compared to the standard AAA title geared toward males, or casual games geared toward females. If you temper your budget and revenue expectations for reaching a smaller market cap, you can go all-in chasing that market, but don’t expect Call of Duty numbers. I think Nintendo is hinting at wanting to milk that demographic since they seem to be willing to spend big money on the Switch as early adopters. Most commenters on NeoGaf and Reddit feel that the demographic slant will balance out once games like Pokemon and Animal Crossing become available. I think more than anything, it definitely shows that males and females have very different buying habits, both as early adopters and as late adopters, along with their interest in certain genres. Studios should definitely be mindful of how they cater content to those markets if they actually want to grow brands or interest from specific market demographics. Now it’s just a matter of playing the waiting game to see which studios will take advantage of the Switch’s rapidly growing install base.